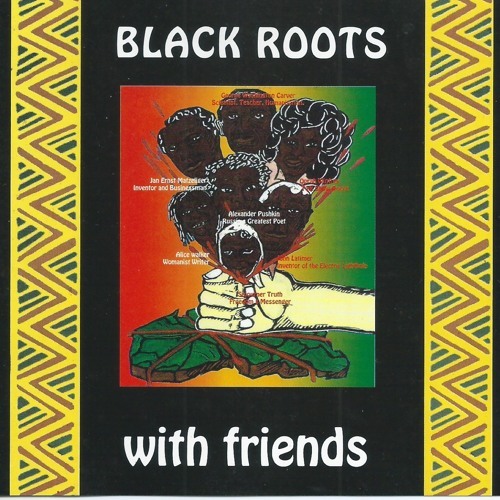 This album was first released in 1993 on Vinyl, Cassette and CD and it is now to be reissued as part of the programme by Nubian Records to make available all of Black Roots’ back catalogue on digital platforms. ‘With Friends’ will be out on 26th April 2019. It is the last full album recorded by the band before activity ceased in the mid-90s for several years in their 40 years long career. The next full album to be recorded by the band was On the Ground that released in 2012 in collaboration with Sugar Shack Records. Black Roots had talked on occasion of inviting other artists to perform some of their classic songs and the circumstances of the band at this time lent themselves to work up such a project. And so, Dub Judah, BB Seaton, Trevor Dixon and Mikey Forbes, all London based artists, were approached to perform on this album. Dub Judah a very respected vocalist, musician, live performer and producer working through his own Dub Jockey record label was asked to and agreed to produce the album. He was given the key task of breathing new life into these songs and used his versatile musical skills to good effect changing the feel of the rhythm section. The recordings play and feel different even though they are all classic Black Roots songs. He added his vocals to two massive songs ‘What Them a Do’ and ‘Tribal War’. The lyrical content of these blend with his personal beliefs reflecting where he was at spiritually and he sang them with heart. You can hear it when you listen back to these two songs. Harris Lloyd "B.B." Seaton, also known as "Bibby", a Jamaican reggae singer, songwriter, and record producer who was a member of The Gaylads, The Astronauts, Conscious Minds, and The Messengers, took on the task of laying vocals on ‘Release the Food’ and ‘Opportunity’ giving these new depth and insightfulness. Trevor Dixon, a lovers rock singer best known for singing on ‘Woman of Moods’ that was first released in 1988 on Groove & a Quarter Records, sang ‘Move On’ and ‘Let It Be Me’, two ballads that suited his smooth land silky vocal style. And Charles Bryan aka Delroy Ogilvie, one of the original front men with Black Roots, came back to do a cameo performance on ‘Chanting for Freedom’ punching out the lyrics in his own inimitable style with Mikey Forbes, another guest reggae singer doing a great version on ‘Confusion’. The other songs featured on this album and given the treatment by Kondwani Ngozi and Errol Brown, the remaining vocalists with Black Roots at this time, are ‘Juvenile Delinquent’. ‘Survival’, ‘Africa’ and ‘The Father’. And so was born ‘With Friends’. The final curtain on the first part of Black Roots’ long and continuing musical career.